A mushroom by any other name is…. well, an enigma. It’s certainly not a fruit or an animal, and it’s sort of a plant but not really. Technically a mushroom is a fungus, but that doesn’t sound appetizing. I like to put it in the umami category: food with a pleasant, savory taste. The mushroom looks unassuming but it is packed with potential. If you can become friends with any of the many varieties of mushrooms, your health could soar. Really. Every day more people are aware of the nutritional value of mushrooms. There’s Vitamin D (not common in plants), defense against tumors and immune system strengthening. Mushroom are cholesterol free and high in potassium. All good to know – but what can you really do with them to get them into your regular eating? Would it help to know that substituting mushrooms for meat on a regular basis could aid in weight reduction? Why? You’ll eat the same amount of food, but the fat is significantly lower. 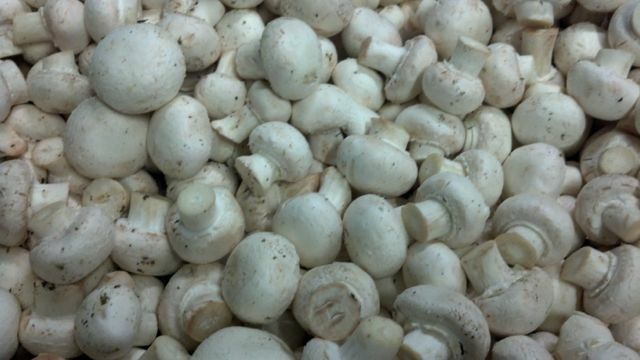 Did you know that per serving, stir-fried (with water) white button mushrooms have more potassium than a banana? I’ve taken a slow but steady approach to eating them. As a child it was “don’t let them touch any part of the pizza I am eating.” Years later, a friend sautéed a few with green beans and butter. Nice. One day I met an exquisitely seasoned, grilled portabella on a wheat bun. Finally I realized how beautiful mushrooms can be! Fletcher Street, Director of Marketing and Sales at Ostrom’s Mushrooms, thinks about mushrooms on a regular basis. Active on The Mushroom Council, she has recently been working with the USDA to get more mushrooms into school lunchrooms. As nutrition guidelines have shifted, schools need to include more fruits and vegetables and have less bad fat. A brilliant idea is to blend mushrooms and beef to make patties. Traditional burgers have gotten smaller (one way to reduce fat and calories) but integrating mushrooms into the mix makes for greater nutrition and greater size without compromising on the calories. Yes – but will the students eat them? Pilot programs have demonstrated that 80% of students actually liked them! One of the beauties of mushrooms is their meaty feeling, so that those who are reluctant to trade meat for mushrooms are more amenable to the change. Experiment with spaghetti sauce. Finely chop mushrooms and add to spaghetti sauce. Go ahead and make it half meat and half mushrooms. It has the bulk and satiation of one made of all meat. Most people won’t even notice the change. Another mushroom idea is to stuff mushroom caps with a mixture of cheese, breadcrumbs, garlic, parsley and olive oil. Broil – no need to disguise these. They go down with a smile. 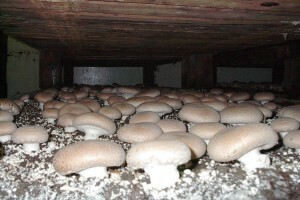 Ostrom’s uses wheat straw, dried poultry waste, canola meal and sugar beet lime to grow their mushrooms. All of these components are agricultural waste products that would end up dumped or burned. Spent compost is sold to a soil company. It makes great soil amendments for wholesale and retail use. Ostrom’s recaptures water run-off for re-use. Cardboard, pallets and plastics are recycled. Their carbon footprint is small being located 50 miles from Seattle and 120 miles from Portland, Oregon. Their retail packaging is recyclable and not produced from petroleum products. Their new packaging with recycled fibers looks like brown craft paper on the inner side. The paper is from Tacoma and the printing and cutting is done in Vancouver, WA. The outer sides are colored coded. 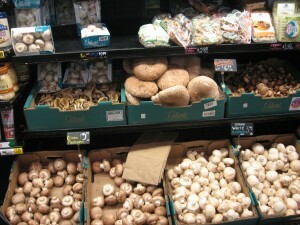 Ostrom’s Mushrooms are sold at locally owned Bayview and Ralph’s Thriftway. Although 65% of the mushroom industry is located in Pennsylvania, Thurston County residents have the ability to get mushrooms grown right here. You can find them at both Bayview and Ralph’s Thriftway stores. Selling mushrooms since 1928, Ostrom’s is a family business that strives to be healthful, ecological and to get the good name of the mushroom into the mainstream of people’s consciousness. Go to their website for recipes by the dish or by the mushroom. Also check out The Mushroom Channel on Facebook.